Right outside Dallas, Texas, sits the city of Grapevine. Many people in the area are familiar with Grapevine as it's adjacent to the Dallas/Fort Worth International Airport. What some people might not be familiar with is Grapevine Ford, the Dallas-area's premier Ford dealer. And what does this car dealer recommend for families looking for a capable, fun-to-drive SUV? The new 2013 Ford Edge, of course! This confident mid-size cruiser features everything that makes family road trips or daily drives exciting: leading technology, high-quality comfort and plenty of room for kids and cargo. It's an SUV you can take from Dallas to Carrolton or Grapevine to Fort Worth and feel good about your trip. Your family will be protected with the latest safety technology like a standard blind spot warning system, electronic stability and roll stability control, a tire pressure monitoring system and the Ford Safety Canopy and Personal Safety systems, which provide 360-degree airbag protection. Beyond safety, the Ford Edge offers Dallas-area drivers a smart and efficient way to travel with two V6 engine options and an Edge-specific version of the EcoBoost engine. This thoughtful SUV was even designed with a front grille that closes at higher speeds to improve aerodynamics, and thus, fuel efficiency. 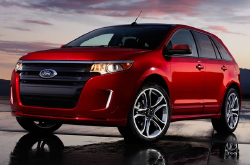 For the complete scoop on the 2013 Ford Edge from Grapevine Ford, continue reading after the video below. When comparing the 2013 Ford Edge to the 2013 Jeep Grand Cherokee, Kia Sorento and the Nissan Murano, and you'll see that the Edge trumps those autos in several aspects. Browse just a few of the reasons below. Get legitimate factory parts and wonderful workmanship from Ford technicians at a convenient shop that's just a brief commute from most any place. At our Ford auto repair center in Grapevine, we offer this and a full year warranty on all services! The professionals at our TX Ford service center can be trusted to keep your Edge in athletic condition for years to come. Just a tiny percent of the services our Ford repair professionals do includes battery replacement, muffler repair and easy simple inspections. Furthermore, you can always rely on receiving budget-friendly service at our Ford auto repair center in Grapevine. Get astounding savings - before you head over to our repair branch, bring a coupon. Click the link below! Your family's going to love this SUV. And you know what that means for you? A quiet, relaxed ride. No more, "Are we there yet, Dad?" In fact, the only problem you might have with your Ford Edge in Dallas is getting your kids out of the vehicle! Be sure to contact Grapevine Ford for more information on all of the optional add-ons and accessories you can include in your Edge to keep the ride comfortable and the family entertained. Grapevine Ford is your choice in the Dallas metro area for the 2013 Ford Edge. See what a difference it makes to travel outside of the city and receive friendly, small-town service at a price that just might surprise you. Low APR rates and financing plans are always available for any credit rating, so visit Grapevine Ford and test drive the new Ford Edge today.